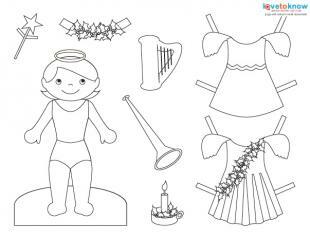 Click to download the angel paper doll. Children enjoy cutting out, coloring and playing with paper dolls. 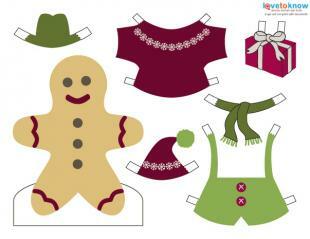 Three exclusive and free printable Christmas paper dolls can be printed using Adobe Reader by clicking on the images. Each paper doll has two printables. One is ready for your child to color and the other is already colored and is ready for play. While it's not necessary, paper doll characters are typically printed on heavier weight paper (80 lb) or regular card stock with the clothes and accessories printed on 20 lb regular printer paper. You can also glue the finished artwork to the paper dolls, add colorful string hangers, and use for Christmas tree decorations. Print off several copies for a larger variety and more coloring fun along with other Christmas printables. The angel has a halo and several accessories, such as a wand with a star, harp, trumpet, candle, holly sash, and dress. Your child can customize the colors of the wings that are part of the dress design. Click to print the angel to color. It wouldn't be Christmas without a gingerbread boy! This adorable guy comes with two hat choices for his alpine outfit. He also has a Christmas present. Do you think it's for the gingerbread girl? 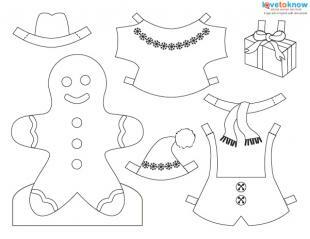 Print the gingerbread boy doll to color. Print the colorful gingerbread boy doll. A gingerbread boy meets his mate with this cute gingerbread girl. She also has a cute alpine outfit that includes mittens, hat, sweater, dress, flower necklace, and stylish candy-striped purse. Looks like she's all set for Christmas! 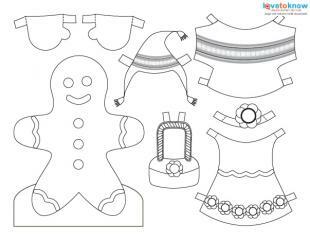 Print the gingerbread girl doll to color. 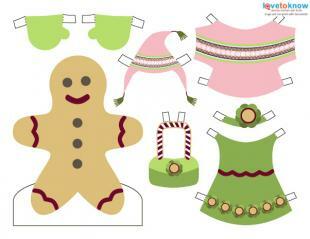 Print the colorful gingerbread girl doll. You can find other printable Christmas paper dolls. Some dolls are girls and boys or women and men. Others are pets, nativity scenes, and of course, Santa and Mrs. Claus. The Graphics Fairy offers a vintage girl Christmas paper doll with four different outfits. Design Dazzle has several free paper doll printables, such as the nativity, Santa's helpers and even a printable Christmas tree with tiny decorations. Tip Junkie goes all out with the winter holiday paper doll free printables that include accessories by Tricia-Rennea. In exchange for the free downloads you must create a user account. Once registered, you'll receive an activation URL to begin downloading printable paper dolls. 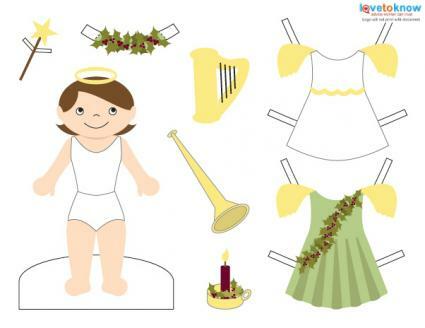 Free Kids Crafts has two free printable Christmas paper dolls. One is a mouse and the other is a dog. Both have two versions. One is colored and the other is ready for your kids to color and decorate. Playing with paper dolls at Christmas is a tradition for many families. With free printable ones, you're sure to keep the cutting and coloring going throughout the season.